It was announced today that the Reduced cost Li-Ion (RED-LION) project – a two-year collaboration between Ricardo and QinetiQ with part-funding from the Department for Transport under the UK Energy Saving Trust Low Carbon R & D programme – has demonstrated the potential of a new low cost Lithium-Ion cell chemistry and associated flexible battery management system for Hybrid Electric Vehicles (HEVs). 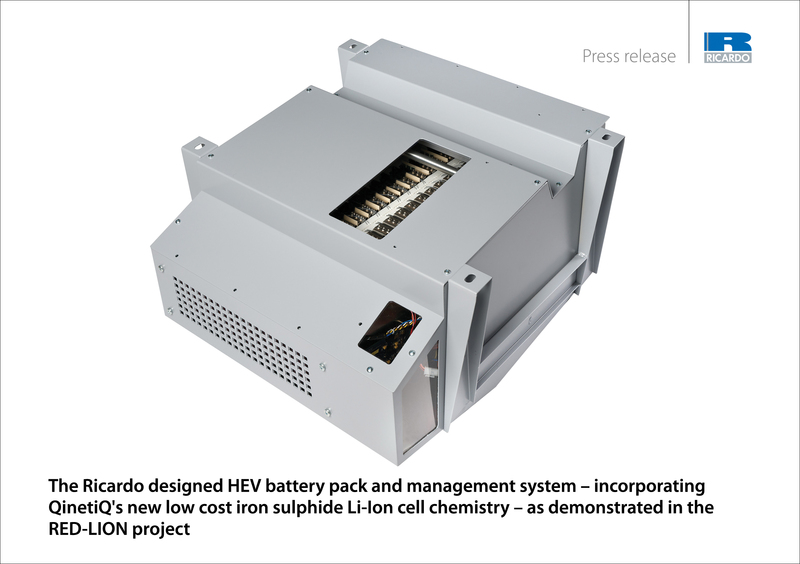 The aim of the project was to develop an alternative Lithium-Ion (Li-Ion) cell chemistry that could be integrated within an HEV using a bespoke battery management system. Following completion of the project, the partners have announced that a battery pack using QinetiQ’s new and innovative iron sulphide-based cell chemistry and Ricardo’s latest advanced Battery Management System, has demonstrated significant cost and weight reductions compared with the reference Efficient-C full hybrid vehicle. 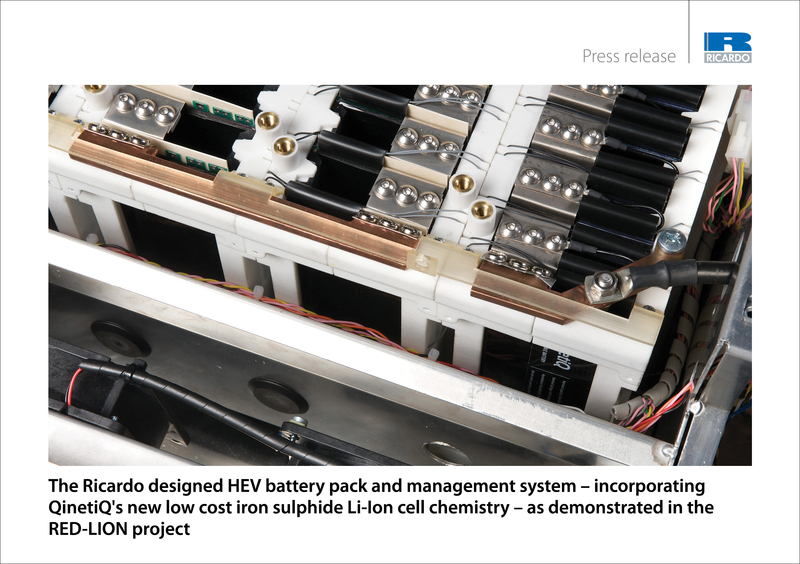 To prove the potential of the alternative cell chemistry, the RED-LION project set out to replace the battery pack used in the Efficient-C prototype HEV with one using new cells capable of demonstrating suitable material cycle life, capacity, specific energy, rate capability and safety. Custom cells were manufactured and packaged within a bespoke battery pack incorporating many novel features. Ricardo designed the overall battery pack to directly replace the existing unit, developing a new battery management system to manage the iron sulphide chemistry. The prototype cells, designed and manufactured wholly by QinetiQ, have been shown to deliver a cycle life of over 1,000 cycles at a limited depth of discharge. The high charge/discharge rate capability shown by the particular cell design would make it suited to both HEVs and low-range Plug-in Hybrid Electric Vehicles (PHEVs). Comparing the performance of the prototype high rate cells with the cells originally used in the Efficient-C HEV, a 20% reduction in weight, on a Wh/kg basis, was achieved. Furthermore, QinetiQ estimates that significant cost savings are possible in comparison with current commercial production Li-Ion chemistries through cheaper raw materials and a more energy efficient patented manufacturing process. 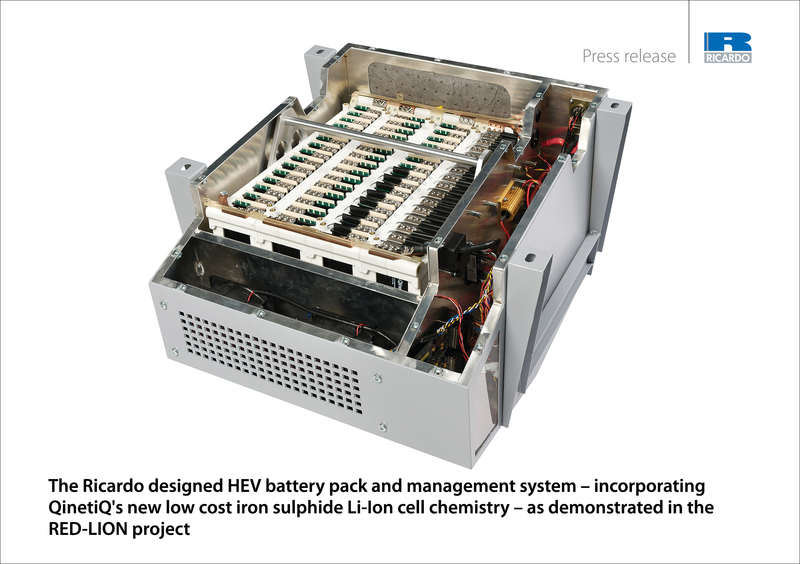 Another key innovation of the RED-LION project is the new battery management system, developed by Ricardo based on a bespoke architecture, which is fully adaptable to a range of cell chemistries and battery architectures. 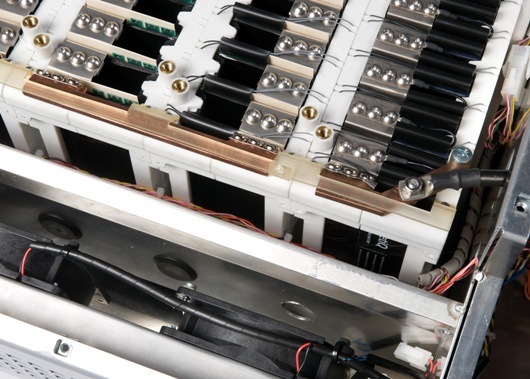 Ricardo has fully integrated its system into a battery pack containing the QinetiQ cells. The pack includes a number of innovations to improve performance and reduce cost, which are the subject of three Ricardo patent applications. The project has demonstrated the potential of the cell chemistry within an HEV environment. Whilst the current cell is most suited to HEVs and low-range PHEVs due to its high charge/discharge rate capability, the inherently high energy density exhibited by the chemistry combined with other anticipated improvements, would make it a strong candidate for all-electric vehicles, not least due to its highly attractive cost versus energy-density benefit. For a copy of the full text of the release and for high resolution image downloads, follow the links at the top right of this page.